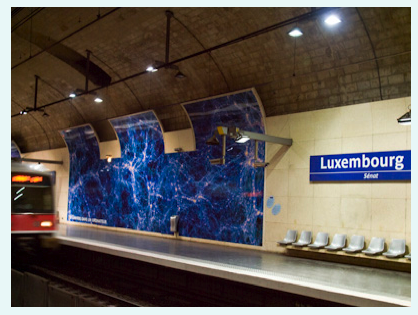 The Institut d'astrophysique de Paris (IAP) is proud to announce a new exhibition of six large images of the Universe on the walls of the Luxembourg RER station in Paris. This exhibition, which was designed in the framework of a unique partnership beetween RATP and CNRS, will be visible until the end of December 2009. The RER B Luxembourg station, with large vaulted ceilings is a unique location to display these images.